This summer, tanning powder is no longer applied alone but is almost always going with blush and/or highlighter. Tanning palettes flourish, taking into account the strobing and even contouring habits of the Millennials. All to get a custom tanned mine! The chocolate tan is definitely “has been” for the benefit of a beautiful radiant glow of health, as Givenchy has understood it so well, whose Make Up is always a precursor, with its new Healthy Glow Powder (€52.50, Summer 2019 Collection “Solar Pulse” in two limited editions marbled Natural Gold or Natural Rosé). 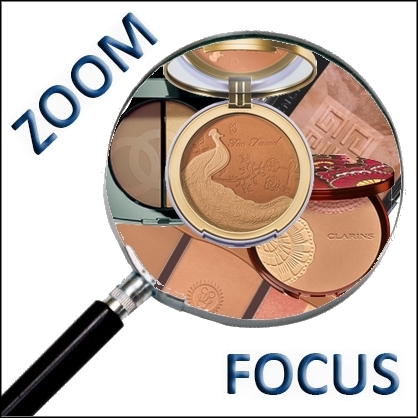 Its unique marbling, a fusion of a bronzer and a highlighter, is available in two versions for light or dark skin. This tanning powder overdosed with mother-of-pearl can be used on the cheekbones but also on the body (shoulders, neckline…). Very easy to use, it sets the tone for the season: a warmed-up look, but with radiance! It is also the choice of Too Faced which, after the Duo Bronzing Powder and Highlighter Pineapple Paradise, with its fresh pineapple scent (€30, Tutti Frutti Collection exclusively at Sephora) will launch in May the Satiny Duo Chromatic Tanning Powder Natural Lust (€32, limited edition). This so kitsch powder is packaged in an XXL case decorated with a majestic peacock that is also carved in the powder! The two delicately sparkling shades can be mixed or applied separately. The icing on the cake is coconut, a specialty of the American brand that flavors most of its makeup products. It is the little extra that can make the difference, as Bourjois has also understood, whose Délice de Poudre Duo Contouring, Poudre Bronzante + Illuminateur (€14.95, a single 055 Hâle universal shade) is flavoured with chocolate. The same appetizing implication at L’Oréal Paris with its new Duo blush and tanning powder Chérie on the Cake (in May, €14.95). But the most delicious perfume - solar floral - is from Guerlain, which will offer Terracotta Contour & Glow Palette, Palette Visage Contour and Éclat (€65, limited edition). This ultra-complete âlette combines four shades: a sculpting matt contour shade, a universal tanning satin shade, a coral pink blush duo and a pearly illuminator. The same art of sunny good looks for Benefit with Cheekleaders Bronze Squad Palette, 5-in-1 Palette, supplied with a large format brush (€62, limited edition), or, more accessible, Cheekleaders Mini Bronze Squad Palette, a 3-in-1 palette containing a blush, a tanning powder and a highlighter (€33). Clarins revisits its Sun Powder (€47.50) by combining three shades: iridescent bronze, highlighter and iridescent pink blush for the 01 Sunset Glow harmony ; matt bronze and two iridescent bronze pieces (one light and one dark) for the 02 Sunrise Glow harmony. Both powders contain anti-pollution active ingredients and pearlescent and soft focus pigments. As for Chanel, the brand is creating a Bronze and Light Duo (Clear or Medium, €60, from May 30) in its Cruise Visions d’Asie Lumière et Contrastes Collection. On one side, a sunny matt powder, on the other, a pearly illuminator. The perfect combo to be radiant this summer!